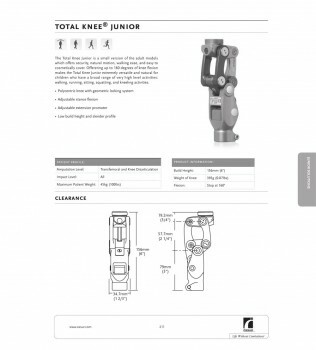 The Ossur Total Knee Junior is a versatile and natural feeling pediatric prosthetic for children with a transfemoral or knee disarticulation amputation and who like to participate in a large range of activities from low, moderate, high, to extreme in impact. It is a smaller version of Ossur’s Total Knee, which provides a similar range of support for adult amputees. With the Total Knee Junior, activities like gentle walking and moving around the home, to climbing stairs and running, to even heavy lifting, field sports and long-distance running are all possible with this easy-to-use pediatric knee prosthetic. 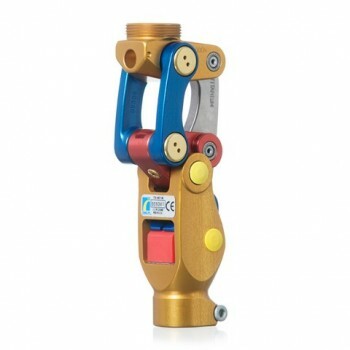 Some technical features that make this pediatric prosthetic knee a great potential solution for young amputees is the low build height and slender profile, adjustable stance flexion, adjustable extension promoter, and a polycentric knee design with geometric locking system. The Ossur Total Knee Junior can support a maximum patient weight of 100lbs and weighs in at a mere 0.87lbs itself, which adds to its ability to provide natural motion, walking ease and overall security for pediatric patients.